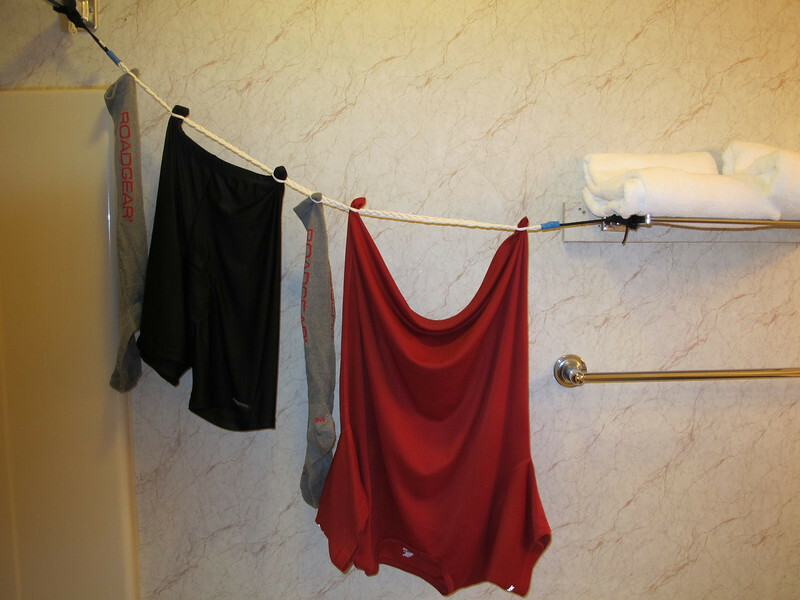 A pinless, travel clothesline is a slick item for motorcycle trips lasting more than a couple of days. Hang it from trees, your bike, your significant other or fixtures in a motel room, and your "performance" fabric shirts and riding shorts will dry overnight; hi-tech type socks in about 24 hours. (You're not still wearing cotton, are you?) You'll be able to pack fewer clothes, and won't have to waste precious time at a laundromat. The best lines will have multiple ways of fastening, including velcro. They're inexpensive, pack very small and weigh next to nothing. Check Amazon or outfitters such as Cabela's and Eastern Mountain Sports. While you're at it, pick up some backpacking leaf-type soap, which will work on both your bod and your laundry.